The members of the Beta Theta Pi fraternity plan to raise funds to make their house wheelchair accessible for their brother who was paralyzed in a car crash in January. The fraternity brothers of a WSU student, who was paralyzed in a car crash while travelling back to WSU after winter break this year, will be holding one silent and one live auction during Mom’s Weekend to raise money for accommodations for their injured brother. Bailey Erickson, a Beta Theta Pi fraternity brother, said he wanted the funds raised in the auction to go toward funding house renovations such as a ramp to accommodate John Crawford. Crawford was left wheelchair-bound following the three-car crash which involved five Beta Theta Pi brothers, including Dashiell Mortell, who was killed in the incident. Justin Crawford, his biological brother, was also injured in the crash. After completing intensive physical therapy in Colorado, Crawford could have attended WSU-Vancouver in his hometown. It was uncertain if he would be returning to Pullman, Erickson said. However, Crawford FaceTimed his fraternity brothers to let them know he would be back. Erickson is Beta Theta Pi’s special events coordinator for Mom’s Weekend. In this role, he proposes the projects that the funds go toward, which he said are usually miscellaneous upgrades for the house. When he proposed funding renovations to make the house more wheelchair friendly, the fraternity brothers voted unanimously to do so. Crawford completed his rehabilitation ahead of schedule and is set to return to WSU next semester. While several plans are being considered, he will most likely live in the house’s live-in adviser’s room, a fairly large room with a handicap-accessible shower. Erickson and Crawford grew up in the same hometown, they both attended Vancouver High School and played on the same basketball team. Tracy Ostrem, Erickson’s aunt, said he and Crawford have known each other since elementary school. She posted in the Facebook group “Die Hard Cougs” to encourage donations to the auctions. Within 24 hours, the home building company Hayden Homes reached out, offering to contribute to the renovation, as did a fraternity alumnus who is a general contractor, and many members of the WSU community. Several families have also donated gift baskets for the auction. “I’ve been getting random phone calls from people throughout the day,” Erickson said. In the months following the crash, a GoFundMe started to raise money for the Crawford brothers’ medical expenses raised more than $50,000. Within four days of the accident, the fraternity raised more than $10,000 from alumni, parents and strangers. 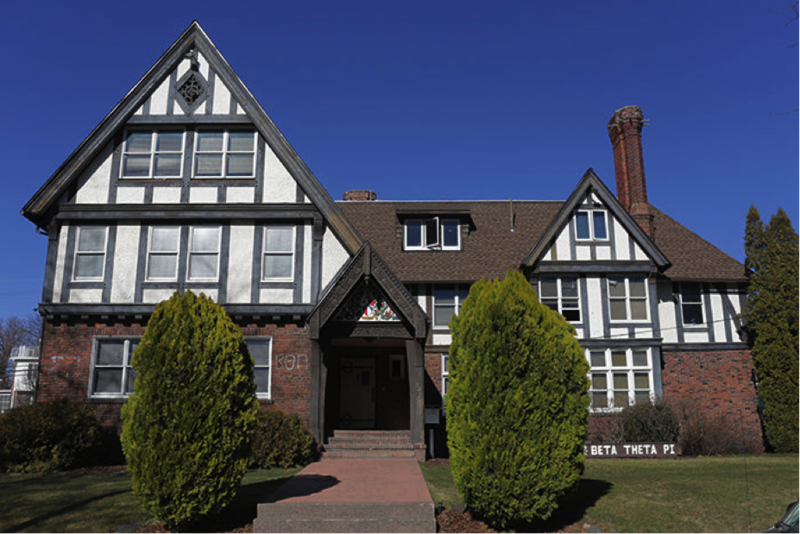 Beta Theta Pi used this money to cover transportation, housing and food for almost 70 fraternity brothers to travel to and attend Mortell’s service in Bainbridge, Erickson said. The brothers donated the extra money to the charity of the family’s choice. Erickson said since the accident, strangers have recognized the brothers on campus by their letters and offered words of support. The house has also received cards and care packages. “I don’t know what our house would have done without the Greek community or the Cougar community as a whole,” he said. Erickson said he is expecting about 50 to 60 moms and 150 to 160 fraternity brothers to attend the event.